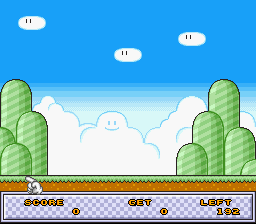 Same Game Mario features Mario-themed elements spawned from Hudson's Same Game. See if you can spot Mario nodding. This likely references the password received after a game has ended. Perhaps characters were written down by players who then sent them to Nintendo as part of a contest? Tawayuki Iwabuchi is the music composer. Additional records such as how many undos the player has made are kept track of and are well-hidden. Use the Pro Action Replay code 81A56905 or Game Genie code D9C1-1409 to replace the Ranking Screen with the hidden Statistics Screen. 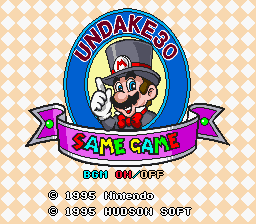 An empty playfield likely used for testing purposes will replace a game of Undake via Pro Action Replay code 81A56306 or Game Genie code D1C1-1DA9. Can be accessed via Pro Action Replay code 818AB302 or Game Genie code D468-CDA1 and it will replace the default in-game music. Can be accessed via Pro Action Replay code 818AB305 or Game Genie code D968-CDA1 and it will replace the default in-game music. Can be accessed via Pro Action Replay code 818AB306 or Game Genie code D168-CDA1 and it will replace the default in-game music. Can be accessed via Pro Action Replay code 809D2B52 or Game Genie code 94B4-14A7 and it will play as soon as a game starts. A Frog can be heard via Pro Action Replay code 809D2B57 or Game Genie code 95B4-14A7 and it will play as soon as a game starts. Ribbit! The sound of a general-stock cartoon bouncing sound can be heard via Pro Action Replay code 809D2B56 or Game Genie code 91B4-14A7 and it will play as soon as a game starts. A bike bell can be heard via Pro Action Replay code 809D2B59 or Game Genie code 9BB4-14A7 and it will play as soon as a game starts. A game start-marker can be heard via Pro Action Replay code 809D2B?? (with "??" being anywhere from 5A-5F) or Game Genie code ? ?B4-14A7 (with "??" being 9C, 98, 9A, 92, 93, or 9E) and it will play as soon as a game starts. Start the game with Pro Action Replay code 809BDDE6 or Game Genie code 31B2-3704 to play all of the used sounds. 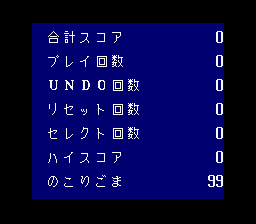 All of the unused content from the Super Famicom version is present in the BS-X release, with some small changes indicating that it is an earlier build. Present at 0x32FF1, the Super Famicom version is 1.17b. The ability to view statistics from the title screen by pressing Select was removed. An option to return to the BS-X BIOS was added after a game has ended. This page was last modified on 22 January 2019, at 08:54.